Metropolitan Waterworks and Sewerage System (MWSS) administrator Reynaldo Velasco is prepared to resign if he cannot comply with President Duterte’s order to resolve the water shortage in Metro Manila. 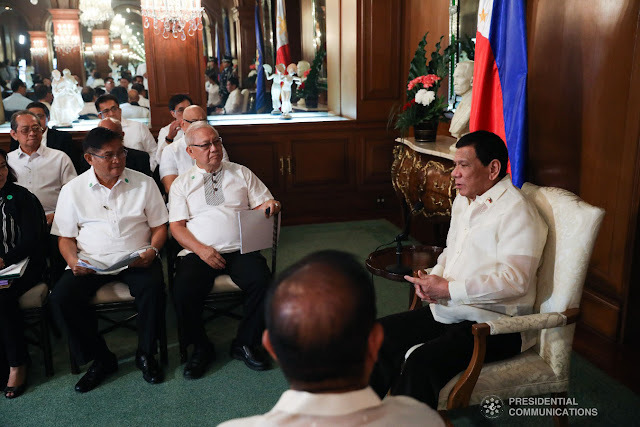 President Rodrigo Roa Duterte discusses matters with the officials of the Metropolitan Waterworks and Sewerage System led by its chairman, Franklin Demonteverde, at a meeting at the Malacañan Palace on March 19, 2019. A day after President Duterte berated MWSS, Maynilad and Manila Water officials over the supply problem, Velasco pledged to craft a 50-year comprehensive roadmap to help ensure water security. “Kakayanin natin ‘yan. If I cannot do it, I will resign immediately,” Velasco said during a Palace press briefing. “We are not worried about the water supply until 2037 which is the end of the concession agreement but we have to go beyond that because ang utos ng Presidente, and even the Senate were asking na gumawa ng masterplan diyan, so we will do the roadmap maybe up to 50 years,” he said. For now, Velasco admitted that no one in the MWSS board has offered to resign because the President has not asked for it during the meeting in Malacañang last Tuesday. He said the President instead gave them time to fix the problem or risk losing their jobs. “Kasi ang sinabi lang niya shape (up) or ship out. In other words, ayusin ninyo muna. Kapag hindi ninyo maayos, go. Pinagbibigyan naman kami na ayusin kaya inaayos ko para hindi ako tanggalin He said shape up or ship out. In other words, fix the problem first. If you cannot fix it, go. He has given us time to fix the problem so I’m trying to address it so I will not be fired],” he said. Velasco admitted though he was willing to step down if Duterte asked for it, saying all presidential appointees serve at the pleasure of the President. “All of us in the board are under the pleasure of the President. We are presidential appointees. Anytime he feels like we can’t do it, and others can take our place, that’s welcome,” he said. “If he asked for it, I will volunteer. I will take responsibility and spare the board. But since he did not ask for it, I am still here,” he added. President Duterte has threatened to fire MWSS officials and terminate the contracts with Manila Water and Maynilad over the water shortage besetting parts of Metro Manila and nearby areas, Malacañang announced early Wednesday morning. In a 40-minute meeting that turned to be a “presidential monologue,” Presidential Spokesman Panelo said the President was outraged by the water officials’ failure to ensure ample water supply for the people. “They simply did not do their job. ‘All they care about is get profit from the water of the people’ and to their sufferance as well,'” he said. Velasco said the President gave a “homily” to the water officials, alluding to the dressing down they received during the Tuesday’s meeting at the Palace. He said the President did not want people to ensure discomfort and suffering amid the recent water supply interruption. “Sinabon kami pero binanlawan kami pagkatapos,” Velasco said. He said Manila Water did not inform the MWSS that it reached the critical point of water supply until it was too late. “They were claiming it was the fault of La Mesa dam. La Mesa Dam is not the main source, the main source is still Angat Dam,” he said. “Nabulaga kami. Kasalanan namin lahat ‘yan [We were surprised. It’s all our fault],” he said. It aims to reach 99 percent service coverage by the end of the month, he added. Among the measures taken to improve water supply were activation of deep wells, Maynilad sharing water through cross border flow, Manila Water’s activation of the Cardona plant, deployment of water tanks in hardest hit areas.